About 200 teachers, students and parents attend a rally at East Hartford High School Tuesday morning in response to U.S. education Secretary Betsy DeVos’s recent remarks. 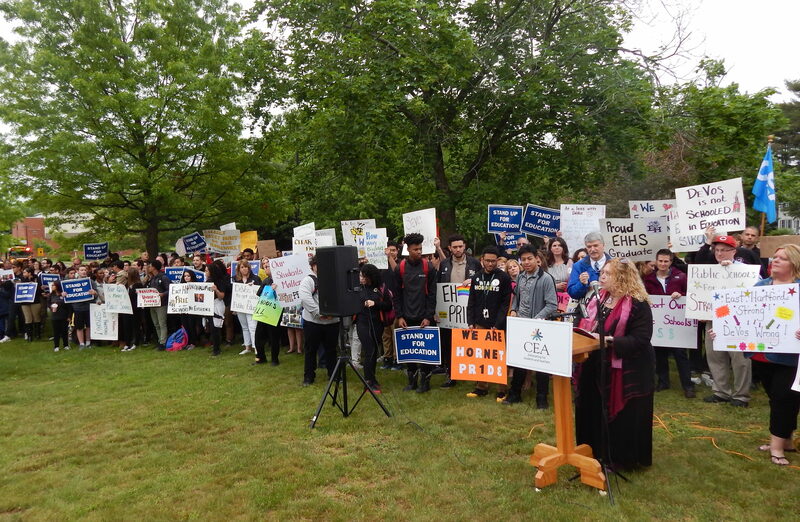 With one voice Tuesday morning, about 200 East Hartford teachers, students and parents repudiated U.S. Education Secretary Betsy DeVos’s grim appraisal of their public school system. The sharp response from the community came in the wake of DeVos’s comments to a congressional panel while advocating for President Donald J. Trump’s budget proposal last week. She singled out East Hartford as one of the nation’s failing school systems, telling the story of Michael, a student who she said received little support from teachers and administrators. Teachers, students and parents wave signs outside East Hartford High School Tuesday morning. It was at least the fourth time DeVos has used this East Hartford anecdote to highlight what she says is the need to shift federal funding toward voucher initiatives, which would subsidize the cost of private school for some students in struggling public school districts. Protesters outside the school had no interest in being the poster child for her campaign. “I can tell just by looking at this crowd, Betsy DeVos messed with the wrong district,” said Annie Irvine, a third-grade teacher and president of the town’s teachers union. For U.S. Rep. John Larson, D-1st District, the attack was personal. An East Hartford native, he graduated from East Hartford High School and later taught there. U.S. Rep. John Larson, D-1st District, speaks at the morning rally. East Hartford Schools Superintendent Nathan Quesnel has invited DeVos to visit the school and examine the quality of education offered there for herself. Gov. Dannel P. Malloy, Larson and some of the school’s students have echoed that call. The U.S. Department of Education released a statement Tuesday afternoon, saying DeVos’s decision to use the anecdote about Michael was not meant to be generalized to the broader student population. To take it that way “is a symptom of the one-size-fits-all status quo that too many continue to seek to defend,” the statement said. 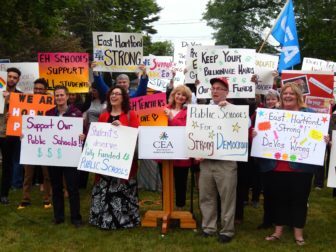 The statement did not say whether DeVos would visit East Hartford. 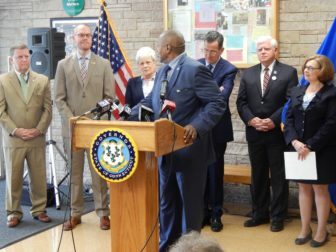 Malloy held a press conference at the high school later in the morning, using DeVos’s criticism as an opportunity to highlight what he said was the “great work” the school system is doing. He was joined by numerous other officials, including Larson, Lt. Gov. Nancy Wyman, Education Commissioner Dianna Wentzell, state legislators and town leaders. “I’m going to declare this a celebration of the good work that’s going on in East Hartford and, quite frankly, a criticism of the bad work that’s going on in Washington,” Malloy said. Wentzell praised East Hartford’s efforts to improve graduation rates in recent years. She said it has risen by 10 percent since Malloy took office. East Hartford has a graduation rate of 88.6 percent. Bryan Hall, chair of the East Hartford Board of Education, turns to address state and federal officials during the press conference. Malloy added that DeVos’s attack presents an opportunity to point out the “folly” of Trump’s education budget. He decried its $9.2 billion in proposed cuts, including significant reductions to Title I and Title IV programs. “We don’t make progress by tearing others down,” Malloy said. While Malloy and Wentzell demurred on attacking DeVos directly, others did not. Lt. Gov. Nancy Wyman was first in line. Larson heaped more criticism upon DeVos, addressing her directly and forcefully in his comments. “You don’t know East Hartford,” Larson said. More funding or more choice? The story of Michael – who has since been identified as Michael Biagioni of Kissamee, Fla., after he posted on Facebook earlier this month about meeting DeVos – is at the crux of the debate over how to address the challenges facing public schools in troubled communities. 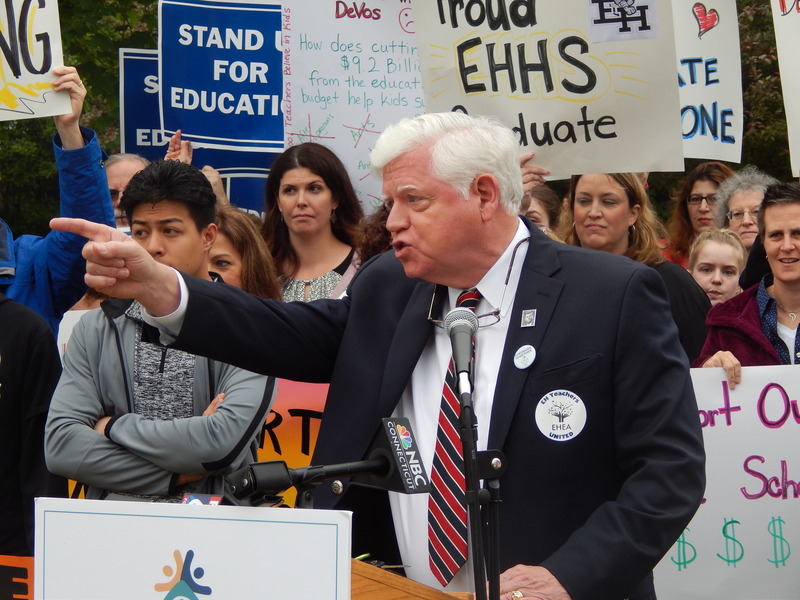 Hartford Superior Court Judge Thomas Moukawsher, in his wide-reaching ruling on the constitutionality of Connecticut’s public education funding system last September, said the state’s system for distributing school aid is “irrational” and thus unconstitutional. While Moukawsher stopped short of ordering the state to provide more total aid to schools, he ruled the legislature must create a more rational funding system. DeVos and others say the answer is not moving dollars around or doling out more. The answer they pitch is greater school choice, arguing funds should be redirected from public schools to voucher and choice initiatives. Malloy disagrees with the idea of reducing federal funding for traditional public schools to pay for voucher initiatives, even though he has supported shifting state funding to public charter schools in the past. The governor said cash-strapped public schools – including East Hartford’s – simply cannot afford additional cuts. Larson said a state’s ability to ensure adequate school funding is impaired when the federal government’s plan is to cut promised spending on K-12 and higher education by $9.2 billion and, in its place, spend $1.4 billion on choice initiatives. “We need that money now and up front,” Larson said. Gov. 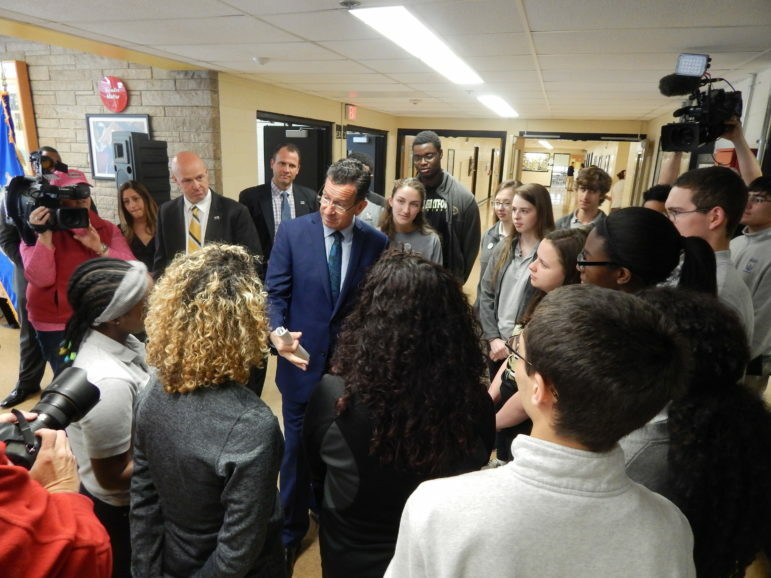 Dannel P. Malloy talks with East Hartford High School students after the press conference.